Here is a recipe I stole from Pinterest~ Gotta love Pinterest!! The best part is it takes all of 15 minutes to make and is AMAZING! 1. Season chicken with salt & pepper on both sides, then saute in a non-stick sprayed skillet over medium-heat until chicken is no longer pink in the center, about 3-4 minutes a side. Remove to a plate, and set aside. I infused a little bit of balsamic vinegar into my chicken to give it a bit more of a bite! It’s delicious! 2. Position oven rack in the second slot under the broiler, about 6-7 inches away from the heat. Lightly butter one side of each bread slice, then place on a foil-lined baking sheet. Broil until golden brown around the edges. Bread like a French Roll or Baguette will work splendidly but choose whatever you like! 3. 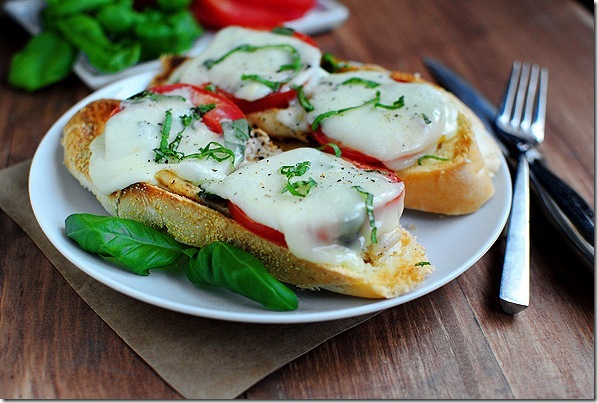 Place cooked chicken on top of toasted bread slices, then top with tomatoes, basil, and cheese. Place back under the broiler until cheese is melted. Crack black pepper over the top, then serve.